Home›Community Design›Link Detroit Construction Begins, Let's Celebrate! Link Detroit Construction Begins, Let's Celebrate! DETROIT—On your mark, get set, go! Detroit's next big biking and walking project is about to rush past the starting line. 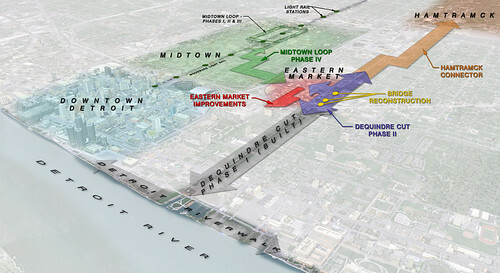 Construction on Link Detroit, a multi-modal enhancement plan put forth by the city to enhance and connect existing greenways projects is now underway. When completed in November 2014, it will create an accessible network of routes for cyclists and pedestrians between major destinations like Eastern Market, Hamtramck, the RiverWalk, downtown Detroit and Midtown. The city of Detroit and other partner organizations believe the multimodal enhancement plan will spur the regional economy while providing cost-effective non-motorized travel options to local workers and residents. Rather than a typical hardhat and shovel groundbreaking, sponsors are now planning a community celebration for supporters at Eastern Market. They hope to attract community members, runners, members of local bike clubs and rides and as many other potential users as possible. Mark your calendar for 6 p.m. Tuesday, Sept. 24 at Eastern Market in Shed 2. Whoever shows up will certainly have a lot of reasons to be festive. Link Detroit is in reality five separate projects: a streetscape enhancement at Eastern Market, three non-motorized travel connections including an extension of the Dequindre Cut north, a new section of the Midtown Loop greenway and bike lanes that will connect with trails in the city of Hamtramck, and replacement of three bridges at Adelaide, Division, and Wilkins and removal of the Alfred Street bridge. Together, these components will also serve as building blocks for a much grander endeavor, the Detroit Inner Circle Greenway, a trail which will form a loop around much of the city. "I think this is something that everybody should be excited about and everybody should celebrate." Jela Ellefson, manager of grants and special projects for the Eastern Market Corporation, told Mode Shift. "We see it as a major economic development. 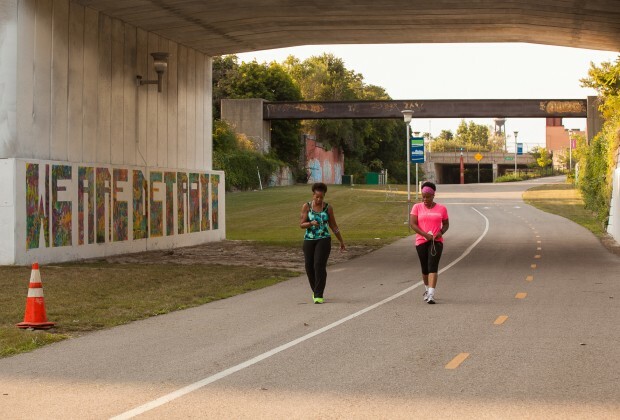 We want to see Dequindre Cut blossom." A federal Transportation Investment Generating Economic Recovery grant application for the project estimated investment in the new infrastructure improvements would "create over 16,000 full-time equivalent jobs throughout Wayne County, largely in the retail, professional services, and construction sectors." Detroit's Department of Public Works, which secured that $10 million TIGER grant from the U.S. Department of Transportation, has taken the lead on the project, while the Detroit Economic Growth Corporation, Midtown Detroit Inc. and Eastern Market are participating as active partners. "This project is called Link Detroit for a reason," said Ellefson. "We want to show people that organizations that maybe in the past would have been more territorial in terms of location ... are working together." In addition to the federal money, funding for the approximately $24 million undertaking is coming from a spicy mix of different city, state, private and philanthropic sources. The Community Foundation for Southeast Michigan, which funds Mode Shift, is one of these sponsors and has provided financing to study, plan and support various aspects of the effort. As for the folks drafting up the routes, they're no strangers to the project. Smith Group JJR, the firm handling Link Detroit's design, previously worked on the Midtown Loop, the first phase of the Dequindre Cut and various district plans at Eastern Market. Construction will be overseen by Parsons Brinckerhoff and carried out by the Angelo Iafrate Construction Company with the assistance of several subcontractors. So what will the project actually look like? To start with, Eastern Market will be getting a major upgrade. The street curbs on Russell Street will be lined up in a consistent manner, and the area will be spruced up with trees and greenery. In addition, new bike parking structures will be installed at the district's main parking lot and at the corner of Russell and Wilkins. The market will also feature easy access to the Dequindre Cut, a below-street level biking and walking path built on an old railroad line in downtown Detroit, which will be extended as part of the project. Currently, it runs from Woodbridge Street near the Milliken State Park at the riverfront to Gratiot Avenue. The extension will take it a mile north to Mack Avenue. Three bridges spanning the Cut will also be repaired and another taken down. "You will be able to get up to Wilkins Street, where there will be an exit and entrance ramp... and you will be also able to continue to go further up to Mack Avenue," said Ellefson. "You will be able to continue biking on Dequindre Cut without having to cross the crazy seven-lane freeways at Gratiot at that point." Another connection will link Eastern Market with Detroit's Midtown neighborhood, home to cultural attractions like the Michigan Science Center and the Detroit Institute of Arts. A new phase of the 1.8 mile Midtown Loop greenway will allow cyclists and pedestrians easy access to the market along a route that stretches across Mack, Brush and Wilkins. 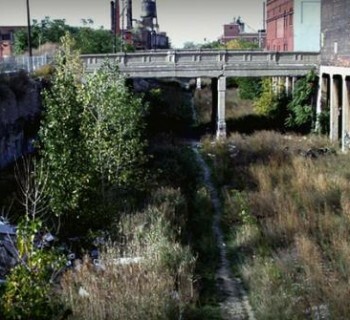 A final component of Link Detroit, called the Hamtramck Connector, will join the Dequindre Cut with trails in Hamtramck via a striped bike lane running east on Mack and then north on St. Aubin. Todd Scott of the Michigan Trails and Greenways Alliance, who helped draft Link Detroit's TIGER grant application, is glad the renovation work is finally set to begin. "It's exciting," he told Mode Shift. 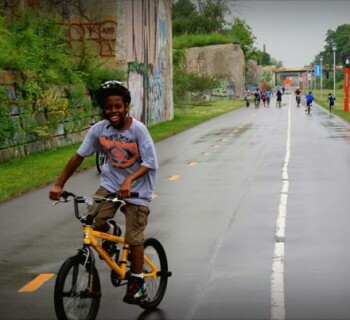 "When the original Dequindre Cut was opened, it made a lot of people see what was possible, and it took it to the next level to build this Link Detroit. 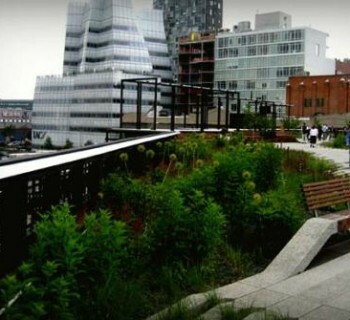 So I'm excited to see what people will think we can do next on an even grander scale." Stay tuned to Mode Shift for this and further updates on the project. Attend the celebration: 6 p.m. Tuesday, Sept. 24, at Eastern Market, Lot 1, Adjacent to Shed 2. Brief remarks, music, refreshments. Right-sizing the city of Detroit: Good or bad?